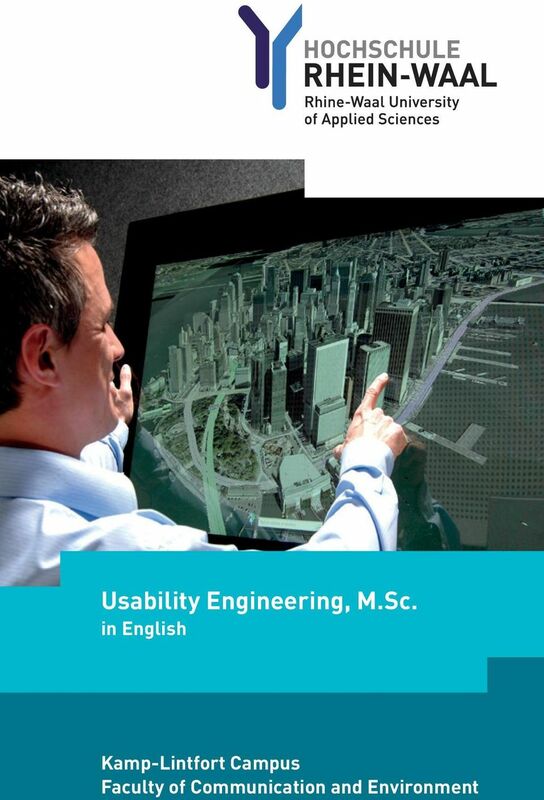 Download "Usability Engineering, M.Sc. in English. Kamp-Lintfort Campus Faculty of Communication and Environment"
2 Usability Engineering, M.Sc. Fact file Place of study Kamp-Lintfort Start date In winter and summer semester Duration of study Three semesters studying full time Degree awarded Master of Science, M.Sc. Language English Master's thesis In the 3 rd semester Welcome to Rhine-Waal University of Applied Sciences Would you enjoy studying surrounded by an open and friendly atmosphere and a young team of professors? At a university where you will be able to learn effectively in small groups and where the main focus is your employability? 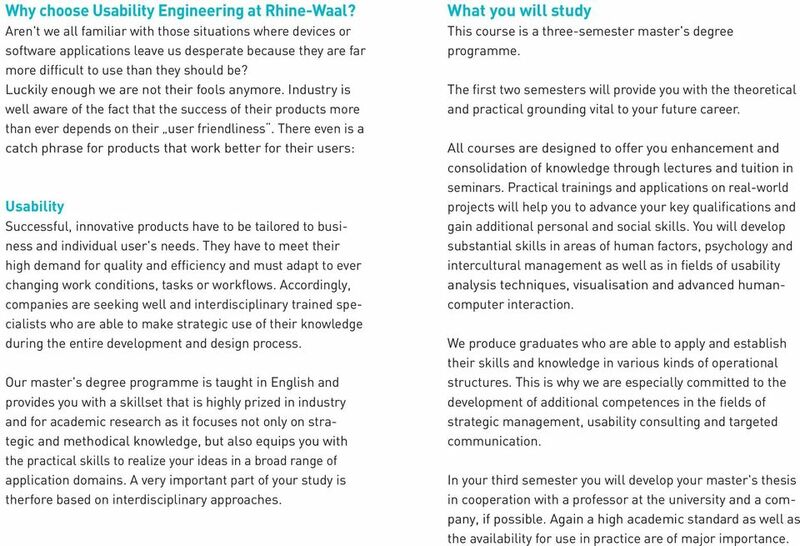 Then Rhine-Waal University of Applied Sciences is the perfect place for you. 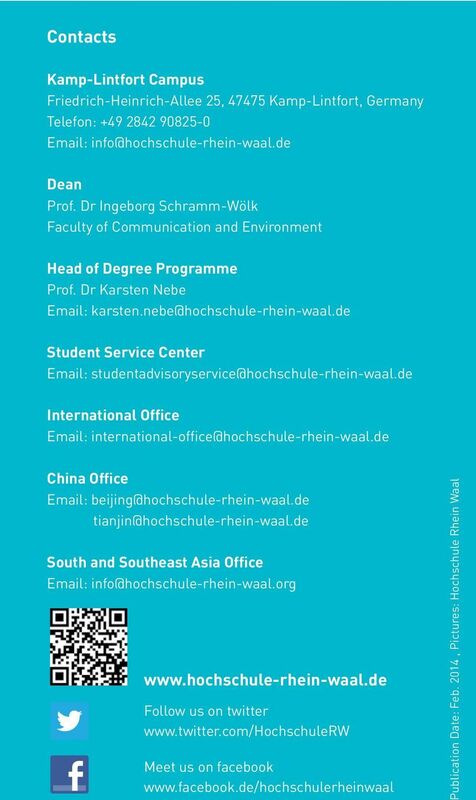 Rhine-Waal University of Applied Sciences is located on two campuses in Kleve and Kamp-Lintfort, each of them offering you state-of-the-art teaching and lab equipment, a university library, a language centre, a canteen and halls - all within easy reach. You may choose to study in Kleve, where you can find the Faculty of Life Sciences, Technolgy and Bionics as well as Society and Economics or in Kamp-Lintfort at the Faculty of Communication and Environment. We take pride in offering you innovative and truly interdisciplinary degree programmes in English and German and the possibility to study either full time or to combine vocational and academic elements. Our fields of study include natural sciences and engineering as well as social, health and economic science. All in all there are 25 bachelor's and eight master's degree programmes to choose from. Our excellent national and international cooperation with industry and science will enhance your employment opportunities. So, why don't you build your future career with us? We look forward to welcoming you to Rhine-Waal. 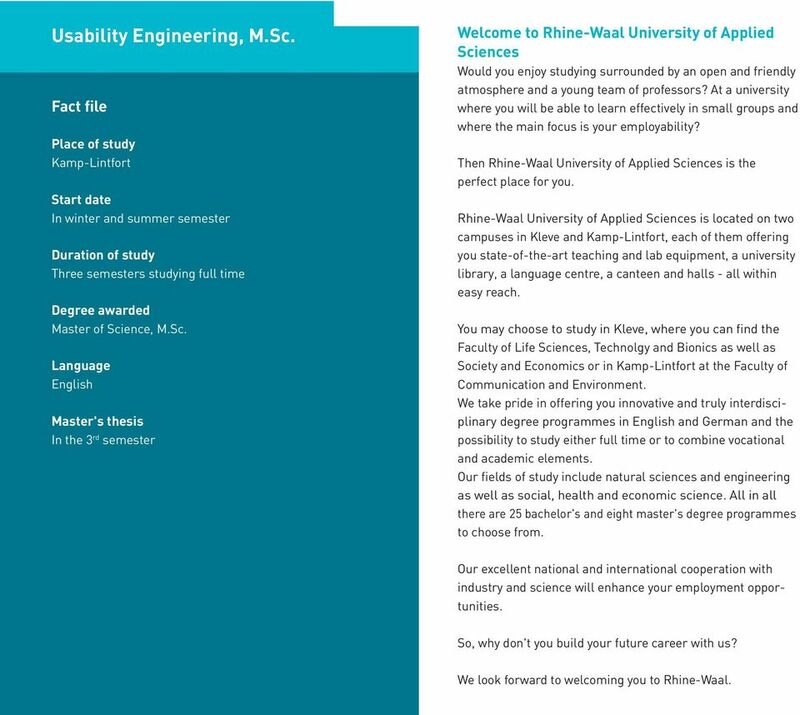 3 Why choose Usability Engineering at Rhine-Waal? Aren't we all familiar with those situations where devices or software applications leave us desperate because they are far more difficult to use than they should be? Luckily enough we are not their fools anymore. Industry is well aware of the fact that the success of their products more than ever depends on their user friendliness. There even is a catch phrase for products that work better for their users: Usability Successful, innovative products have to be tailored to business and individual user's needs. They have to meet their high demand for quality and efficiency and must adapt to ever changing work conditions, tasks or workflows. Accordingly, companies are seeking well and interdisciplinary trained specialists who are able to make strategic use of their knowledge during the entire development and design process. Our master's degree programme is taught in English and provides you with a skillset that is highly prized in industry and for academic research as it focuses not only on strategic and methodical knowledge, but also equips you with the practical skills to realize your ideas in a broad range of application domains. A very important part of your study is therfore based on interdisciplinary approaches. What you will study This course is a three-semester master's degree programme. The first two semesters will provide you with the theoretical and practical grounding vital to your future career. All courses are designed to offer you enhancement and consolidation of knowledge through lectures and tuition in seminars. Practical trainings and applications on real-world projects will help you to advance your key qualifications and gain additional personal and social skills. You will develop substantial skills in areas of human factors, psychology and intercultural management as well as in fields of usability analysis techniques, visualisation and advanced humancomputer interaction. We produce graduates who are able to apply and establish their skills and knowledge in various kinds of operational structures. This is why we are especially committed to the development of additional competences in the fields of strategic management, usability consulting and targeted communication. In your third semester you will develop your master's thesis in cooperation with a professor at the university and a company, if possible. Again a high academic standard as well as the availability for use in practice are of major importance. 4 Career prospects By putting a special emphasis on innovative problem solving methods considering interdisciplinary and international approaches, our degree programme aims to equip you for a career that matches future labour market needs and trends. Complementing the individual skills you have gained in your bachelor's degree, our master's degree will strengthen your employability in all areas in which interactive systems are designed and developed. Your employment will be beneficial wherever products are required for the use by people. Entry requirements Our master's degree programme has been designed for computer scientists, psychologists and designers with experience in software application who would like to advance their subject specific skills and knowledge by gaining expertise in the field of usability engineering. 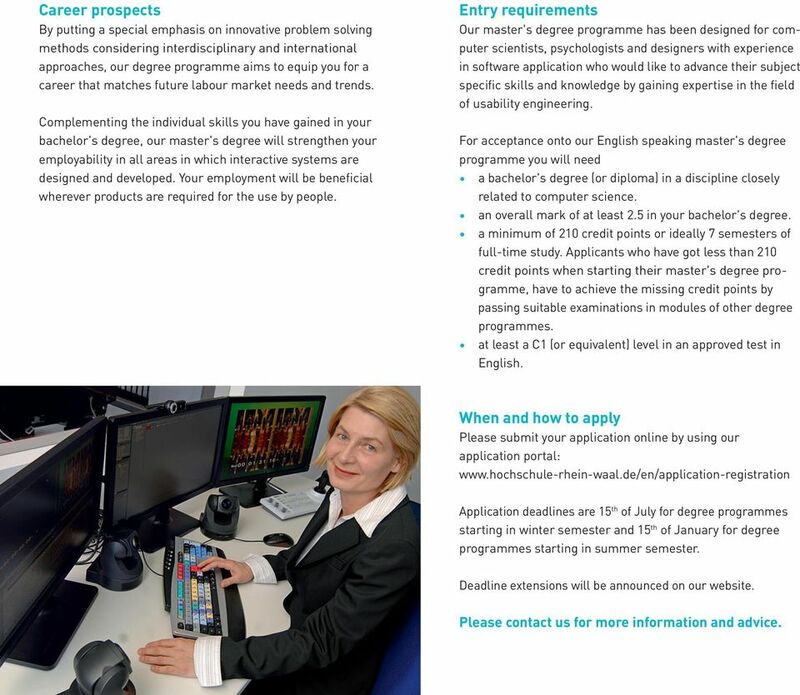 For acceptance onto our English speaking master's degree programme you will need a bachelor's degree (or diploma) in a discipline closely related to computer science. an overall mark of at least 2.5 in your bachelor's degree. a minimum of 210 credit points or ideally 7 semesters of full-time study. Applicants who have got less than 210 credit points when starting their master's degree programme, have to achieve the missing credit points by passing suitable examinations in modules of other degree programmes. at least a C1 (or equivalent) level in an approved test in English. When and how to apply Please submit your application online by using our application portal: Application deadlines are 15 th of July for degree programmes starting in winter semester and 15 th of January for degree programmes starting in summer semester. Deadline extensions will be announced on our website. Please contact us for more information and advice. Your Master Programme to Success! Faculty of Business, Economics and Social Sciences Master of Science INTERNATIONAL BUSINESS AND ECONOMICS Your Master Programme to Success! Latest Update: November 2014 Take your career into your own hand! WE FORM EUROPE S TOP EXECUTIVES! The graduates who succeed on the program s conditions get graduate degree within doctor of philosophy title. COURSE OF STUDY INFORMATION TECHNOLOGY, M.ENG. STATE APPROVED UNIVERSITY COURSE OF STUDY RESEARCH, DEVELOP AND SHAPE THE FUTURE! Nowadays, we can no longer think of our environment without electronic equipment. Joint Degree with Pompeu Fabra University, Barcelona MSc Strategic Communication and Public Relations School of Arts and Humanities http://stir.ac.uk/in Why MSc in Strategic Communication and Public Relations?